Separate from being a deafening, yelling TV culinary expert Gordon Ramsay has made an enormous impact on my cooking. The milder side of him is clear in Ultimate Cookery Course, where he highlights his affection for the straightforward, stunning homemade meals he makes. In one of Ultimate Cookery Course episodes was this sweet and spicy dish, I was left with one thought on my mind - to get in my kitchen and give it a try. There are a lot of elements to this Asian style dish and when combined, the aromas alone are incredible.The taste is more than incredible. The fresh and hot, sweet and spicy, fresh and tangy, flavors will electrify the taste buds of any food lover. 1. Rinse the iceberg lettuce leaves and pat dry, careful not to tear them. Set aside. 2. In a large nonstick pan, heat oil over high heat. Add red pepper and onion, cook 3 minutes. Add ground beef and cook 5 minutes, breaking up with a wooden spoon. 3. Drain grease and return pan to cooker; reduce heat to medium. Season with salt and pepper. 4. Stir in garlic, soy sauce, hoisin and chili sauces, ginger, rice wine vinegar and honey. Cook until sauce has thickened, 3-4 minutes. Stir in chopped spring onions. 5. Spoon cooked beef mixture into a medium bowl and place on a large serving platter. 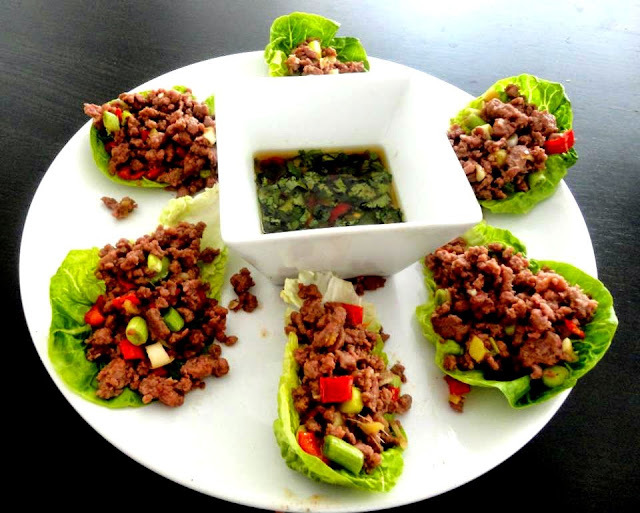 Arrange lettuce leaves around the bowl and serve.